Wow! Looks like a GREAT Book! I am not much of a reader but, as an owner of various birds for 12years I could not put your book down!. I now own an Umbrella, African Grey, Yellow naped Amazon and a very lively conure. Your story was touhcing and really hit home. It should do well. I just finished reading your book and I loved it. It made me laugh & it made me cry. Thank you for sharing your story about Sarah. I wish I had known her... I'm heartbroken that she's gone. A beautiful story! Could not put it down!! I think we are related. I, too, have taken in many birds. I currently have 2 African Greys, 2 Macaws, a Moulaccan Cockatoo, 2 goffin cockatoos, 2 conures, an Amazon, 2 cockatiels and a starling. They join 5 dogs, one cat and many, many koi and goldfish. There is also 2 aquariums in the house. I loved your book. I can't wait to read the next one. Thank you for your kindness to all animals including the raccoons. This is NOT a place for submitting author queries. Thank you. Are you interested in reading or buying this book? When I arrived home from New York, the massive black cage dominated most of our small living room. Looking out from behind the bars was the blue-and-gold macaw that my friend Stephanie had given me without cost because of my track record in redeeming problematic or rescue animals. "Peg Leg," as she had been named by her previous owner, was a rescue bird, much larger than I remembered and, according to her previous veterinarian, vicious. I had seen her only once at Stephanie's wild bird rescue ranch, but here in our ten-by-twelve-foot space she seemed far more imposing. She was nearly two feet tall, and her most impressive feature was certainly her feathers, brilliant blues and golds that extended to the tip of each two-foot wing. Then there were the eyes, soft black inside a white mask streaked with black lines like those of a Mayan shaman or African warrior. The effect was dramatic and not just a little intimidating, although not as intimidating as the beak, also black, which from nose to crown measured nearly four inches. She had only one foot. Her left foot had been cut off by her captors while they tried to release her from the parrot snare that had ended her life in the Amazon basin. As I moved closer to the cage, her powerful gaze asked only one question: Predator or prey? The bird I had originally wanted was an African Grey, far smaller than a macaw and known for its high verbal fluency and mild temperament. I had first seen one at a "Parrot Weekend Experience" sponsored by Stephanie and a group of breeders, rescuers, owners and veterinarians. For three days I listened to lectures, heard amazing stories of bird antics and adventures, while interacting with both domestically raised and wild-caught parrots -- from cherry-headed conures to cockatoos to African Greys to the ultimate macaw, the largest of all the parrots and the most temperamental. Given the size of the macaw’s beak and the bird’s propensity for biting, I was hesitant to hold one or have it perch on my arm. Much more my style was the Grey I fancied, who unfortunately already belonged to someone else. This weekend had been a gift from my husband, Kerry, who thought I would enjoy being exposed to these exotic creatures far beyond my usual family of dogs and cats. Something happened during that weekend, some strange pull to these living relics from the dinosaur age who seem to know what we have forgotten about being wild and wise. When I was a child, lost animals always seemed to find me -- mostly cats and dogs but sometimes hamsters or guinea pigs. When I was six, I had a gopher friend for whom I would steal carrots from the refrigerator, then sneak outside to feed him in his burrow. Even after I became an adult, cats and dogs still gravitated to me, along with the occasional squirrel or raccoon. When I met Kerry, my family was small -- one dog and one cat -- but I warned him that more would show up; it was only a matter of time. Since our home is in the woods, the possibilities were endless. I’d recently rescued a baby squirrel who had fallen from its tree home and landed in the middle of our deck, where my numerous cats were circling for the kill. Wrapping him in a fluffy washcloth, I carried him in a sling that held him against my chest for warmth and a friendly heartbeat. I fed him mashed up fruits, along with a little water, and he slowly regained his strength. After a few days, I took him to a stand of oak trees whose branches offered many possibilities for both a new home and safety from marauding cats. captors were forced to cut off her left foot in order to release her. From there she had been shipped to a first-time breeder in Ohio who had illusions of raising scores of little birds that would sell for as much as two thousand dollars each. The illusion didn't take account of the incessant screaming of two macaws who hated each other and refused to mate. In retaliation and frustration, the woman beat them with a stick poked through the bars. 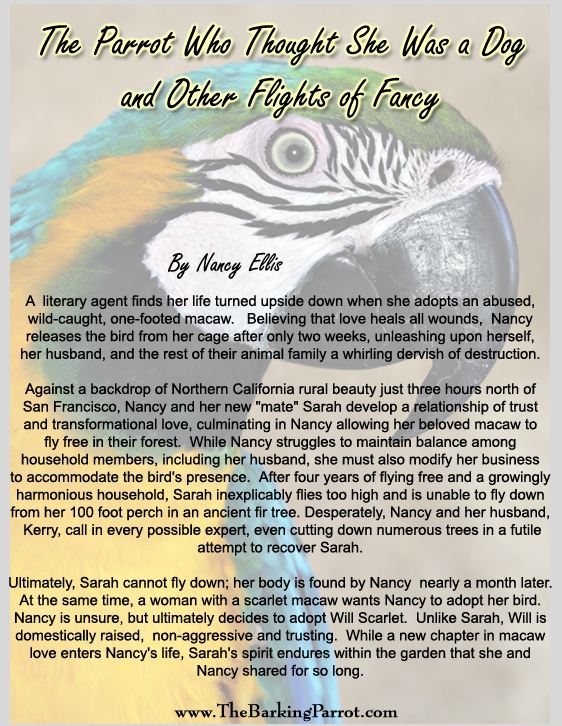 Saddened by her own behavior, the woman offered the birds to a local veterinarian who had contacts in California for wild bird rescues. Peg Leg and Asia, her mate, then made their way to Willits, where Stephanie added them to her other sixty or so birds, all wild caught and all living in cages. Her aviary was under construction when I attended the Parrot Weekend, but even when completed it would be able to accommodate only fifteen to twenty birds; the rest would remain caged and, to my mind, spiritually broken. Peg Leg's scenario was even worse; she was sick with an infectious disease, so her cage was in isolation in a tiny laundry room. That was where I first met her. 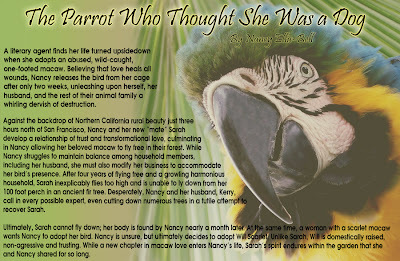 When I had left for New York, I was not yet convinced that I could or would trade my African Grey dream for a macaw nightmare. Kerry had offered to buy me a Grey, planning to have the bird there for me when I returned. Still, there was something about Peg Leg’s eyes that captivated me from our first meeting; that proud bird in a pitiful cage was beginning to unravel my dream. I told Kerry that I would leave the final decision up to him, since he was going to have to live with the bird, too. Both he and I agreed that birds should not be caged, so the temperament issue was crucial. Peg Leg was vicious, trying to bite whoever fed her through the bars. Was this a bird we could live with? What about our other animals -- and those to come? What would happen if things didn't work out and we had to return her to Stephanie? What to do, what to do?